Filters and sorting have been added to our domain vs domain report! We are pleased to announce that we've been continuing to work hard to improve the quality of our tools, and we've now released the ability to sort your domain vs domain reports! You now have the ability to group and analyze this data in a much more convenient manner. Sorting is available for domain vs domain on the following fields: Volume, CPC, Competition, Results, and Positions for each domain. You can quickly find both the top keywords, and the lowest competition. Depending on your needs, and the characteristics and size of your project, you'll likely require different metrics and sort methods. Now, you can quickly find them. We've also added filters to domain vs domain, on the following fields: Volume, CPC, Competition, Results, and Positions for each domain. This will allow you to narrow down the data, and drill down to exactly the data that you're looking for. In the screenshot example, you can see how we've filtered out keywords on Zappos.com to get only the first positions in organic and Adwords. 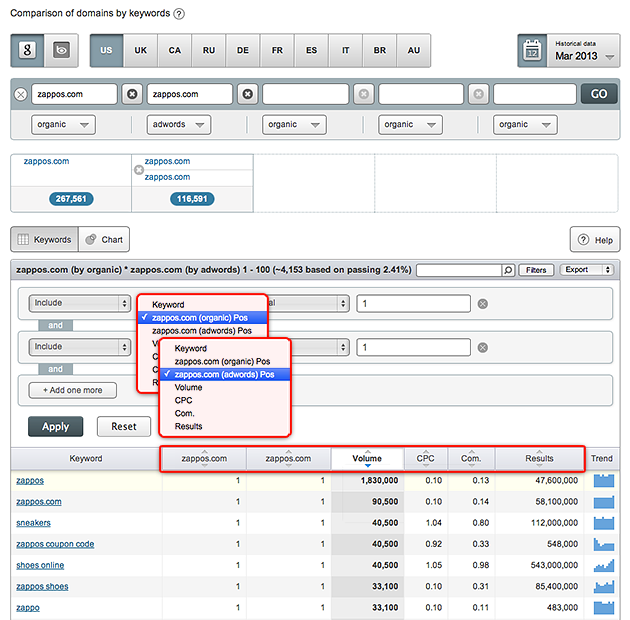 Remember, you can add multiple filters and really dig down deep to find the specialized keywords that you need. The main thing to keep in mind - it's now limited only by your imagination! Live Update now has a Filter!